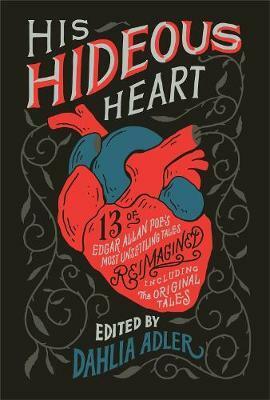 Thirteen of YA's most celebrated names reimagine Edgar Allan Poe's most surprising, unsettling, and popular tales for a new generation. Edgar Allan Poe may be a hundred and fifty years beyond this world, but the themes of his beloved works have much in common with modern young adult fiction. Whether the stories are familiar to readers or discovered for the first time, readers will revel in Edgar Allan Poe's classic tales, and how they've been brought to life in 13 unique and unforgettable ways. Contributors include Dahlia Adler (reimagining "Ligeia"), Kendare Blake ("Metzengerstein"), Rin Chupeco ("The Murders in the Rue Morge"), Lamar Giles ("The Oval Portrait"), Tessa Gratton ("Annabel Lee"), Tiffany D. Jackson ("The Cask of Amontillado"), Stephanie Kuehn ("The Tell-Tale Heart"), Emily Lloyd-Jones ("The Purloined Letter"), amanda lovelace ("The Raven"), Hillary Monahan ("The Masque of the Red Death"), Marieke Nijkamp ("Hop-Frog"), Caleb Roehrig ("The Pit and the Pendulum"), and Fran Wilde ("The Fall of the House of Usher"). "Heartbreaking, thrilling, gruesome, and gorgeous: these stories will delight longtime Poe fans just as much as readers who haven't read the classics." Dahlia Adler is an Associate Editor of mathematics by day, a blogger for B&N Teens, LGBTQ Reads, and Frolic by night, and an author of Young Adult and New Adult novels at every spare moment in between. Her books include the Daylight Falls duology, Just Visiting, and the Radleigh University trilogy, and her short stories can be found in the anthologies The Radical Element, All Out, It's a Whole Spiel (Knopf, 2019), and His Hideous Heart (Flatiron Books, 2019), which she also edited. Dahlia lives in New York with her husband, son, and an obscene amount of books, and can be found on Twitter and Instagram at @MissDahlELama.